Vir­ginia post-rock band Gifts from Eno­la, found­ed in 2005, released their fifth album, the self-titled Gifts from Eno­la, ear­li­er this month. With Gifts from Eno­la, the band has fur­ther devel­oped its rich instru­men­tal sound to cre­ate an ener­getic, tight­ly-packed album which, while suf­fer­ing from cer­tain less-than-excit­ing sec­tions, is gen­er­al­ly quite inter­est­ing. Gifts from Eno­la does a very good job with the con­struc­tion each of its five tracks, as well as the ele­ments from which they’re con­struct­ed. Cre­ative instru­men­tals, includ­ing excel­lent per­cus­sion, are mixed across a num­ber of both dis­crete and care­ful­ly woven lay­ers to cre­ate the album’s com­plex sound. The band does a good job of vary­ing their approach, espe­cial­ly between tracks. This is made even more ben­e­fi­cial to the over­all sound of the album through care­ful use of tran­si­tions, which allow for near-seam­less trav­el between tracks. Along with the band’s main instru­men­tal styles, the band includes cer­tain quite dif­fer­ent inter­ludes and ele­ments. These regret­tably include the ill-advised vocal inte­gra­tion of tracks like “Dime and Suture” - but also sig­nif­i­cant­ly bet­ter cho­sen sec­tions, such as the excel­lent clos­ing sec­tion of “Lion­ized,” which uses a echo­ing ver­sion of 40s style music to lend a new atmos­phere to the track. 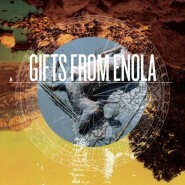 While Gifts from Eno­la is cer­tain­ly an inter­est­ing album, a num­ber of flaws pre­vent it from being excel­lent. Most impor­tant of these flaws is the vari­abil­i­ty in qual­i­ty along the album. Cer­tain sec­tions are excel­lent, dis­play­ing the per­fect mix of the band’s instru­men­tal con­tri­bu­tions. How­ev­er, it’s regret­tably com­mon for those excel­lent sec­tions to be fol­lowed by or even sur­round­ed by much less inter­est­ing parts. While rep­e­ti­tion lead­ing up to a grand crescen­do is quite com­mon as well as quite com­mon­ly well done in post-rock, in a num­ber of places on Gifts from Eno­la it seems more like mediocre sec­tions are sim­ply being over-repeat­ed to set the stage for the excel­lent sec­tions. This rep­e­ti­tion isn’t helped by very long tracks, which, while also a sta­ple of the genre, on Gifts from Eno­la seem to lose steam - not at the end, where they gen­er­al­ly exit with their great­est ener­gy - but at var­i­ous places along the way. Gifts from Eno­la is large­ly instru­men­tal, with a few notable (and most­ly regret­table) excep­tions. As pre­vi­ous­ly stat­ed, one of these is “Dime and Suture“ ‘s under­ly­ing vocal por­tion, which is best described as “met­al-styled.” How­ev­er, instead of pro­vid­ing the short digres­sion from the band’s nor­mal meth­ods that you might expect, this and oth­er such sec­tions (which are admit­ted­ly gen­er­al­ly low­er-key than that on “Dime and Suture”) dis­tract the lis­ten­er from the band’s instru­men­tal strenghts, redi­rect­ing the music in a way that does lit­tle to improve it. Giv­en Gifts from Eno­la’s flaws, it is not quite an excel­lent album. How­ev­er, thanks to a great deal of cre­ativ­i­ty on the part of Gifts from Eno­la, both in the con­struc­tion of the album and in the con­tri­bu­tions of each of the band’s mem­bers, it is cer­tain­ly an inter­est­ing one. Though Gifts from Eno­la suf­fers from a num­ber of weak sec­tions, those sec­tions which are suc­cess­ful are gen­er­al­ly quite suc­cess­ful, such that the album is, by the end, cer­tain­ly more good than bad.